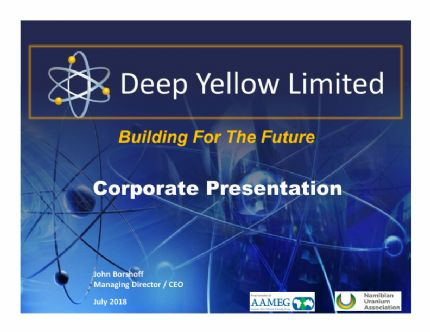 Perth, Nov 28, 2018 AEST (ABN Newswire) - Deep Yellow Limited ( ASX:DYL) ( OTCMKTS:DYLLF) (Deep Yellow) is pleased to announce that the resource infill drilling in the Tumas 1 East area on EPL3497, testing two of the five tributaries, has now been completed. Extensive uranium mineralisation has been confirmed within Tributaries 1 and 2. 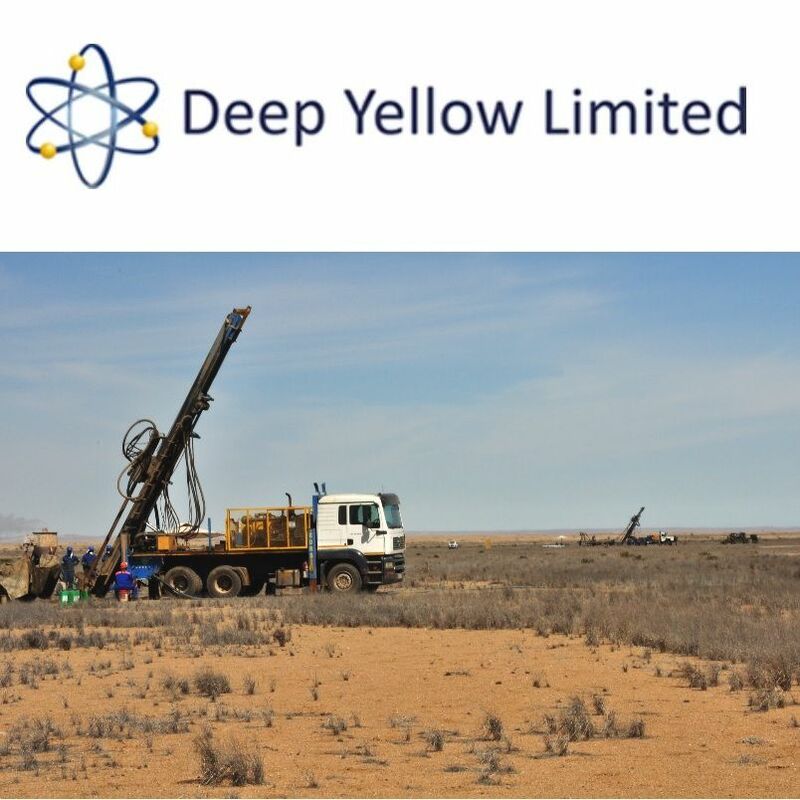 EPL3497 is held by Reptile Uranium Namibia (Pty) Ltd, part of the group of companies wholly owned by Deep Yellow. - Resource definition drilling in the Tumas1 East area has tested two of the five tributaries targeted for follow-up with drilling of the balance planned for 2019.
o 157 infill holes drilled, 92 returned >100ppm eU3O8 over 1m. - Resource upgrade drilling has commenced using two rigs on Tumas 3 West to complete the drilling campaign for 2018. - A new resource estimate for Tumas 1 East and Tumas 3 West is expected in Q1 2019. - Mineralisation is calcrete-associated hosted within palaeochannels, similar to the Langer Heinrich uranium mine located 30km to the north. Since the last drilling update (as reported 5 November 2018) 157 holes have been drilled from 1 to 23 November for 1,828m completing the resource definition drilling on Tributary 1 and the upper reaches of Tributary 2. In total, 265 RC holes for 3,100m have been drilled since 1 October testing these two tributaries. Although more resource infill drilling is required in Tumas 1 East to test three more mineralised tributaries that have been identified, the two RC rigs working in this area have now been moved to carry out resource drilling over the highly prospective western extension of the Tumas 3 discovery. This will then complete the 2018 drilling campaign. Figure 1 (see link below) shows the prospective paleochannel system outline and prospect locations. 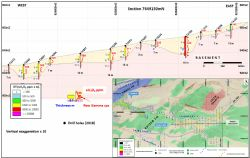 As previously reported, exploration drilling testing the headwaters east of the Tumas 1 deposit has identified a uranium-fertile multipronged channel system comprising, at this stage, seven tributaries draining into the main Tumas palaeochannel in the vicinity of the Tumas 1 deposit. Continuous uranium mineralisation was identified along Tributary 1 and the upper reaches of Tributary 2 (see Figure 2 in link below). 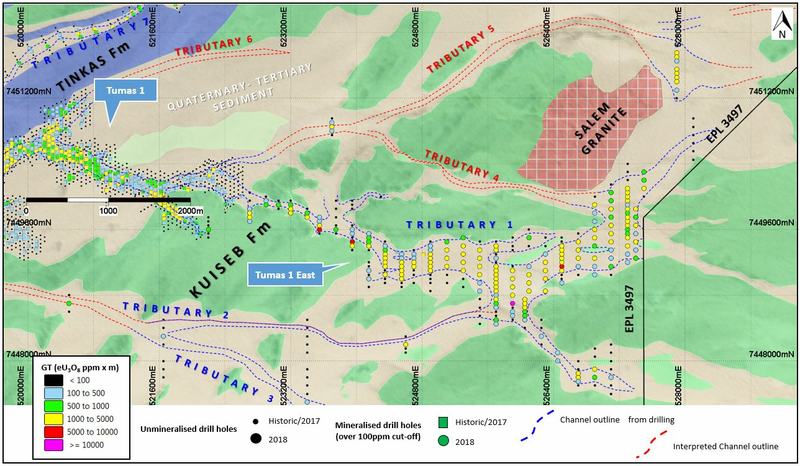 Resource infill drilling from November 1 to 23 has now confirmed the continuity of this uranium mineralisation for 4.6km in Tributary 1 and 1.6km for Tributary 2, all totalling 6.2km. These mineralised channels range from 100m to 900m in width. The mineralisation is located at shallow depth from surface to 20m. Except for localised hot spots, large parts of this mineralisation do not show any surface radiometric expression. The 265 RC holes drilled since 1 October to test Tributaries 1 and 2 are now earmarked for resource estimation. Of this, 192 or 72% show uranium mineralisation above 100ppm eU3O8 over 1m. The average grade, at a 200 ppm eU3O8 over 1 m cut off, is 434ppm with an average thickness of 6.6m and is well within the range of the 300 to 500ppm target. In places the mineralisation can reach a thickness of up to 14m (TA238) and grade of up to 1,799 ppm eU3O8 (TA230). Drill hole and channel locations are shown in Figure 2(see link below). Figures 3 and 4 (see link below) show a drill crosssection through the main Tributary 1 and a drill long-section respectively highlighting the continuity and thickness of mineralisation. Mineralised intersections from the current reporting period that are above the 100ppm U3O8 over 1m cut-off are tabulated in Table 1, Appendix 1. Table 2 in Appendix 1 lists all holes drilled in this period. The equivalent uranium values are based on down-hole radiometric gamma logging carried out by a fully calibrated Aus-Log gamma logging system. The resource infill drilling has been highly successful, identifying 6.2km of continuously mineralised palaeochannel. In total, 336 RC holes for 4,100m were completed over 2 months over the entire Tumas 1 East area. Those two of the five prospective tributaries that have been infill drilled will be the focus of a new resource estimation to be completed in early 2019. Drill spacings have varied from 50m to 100m along lines 100m to 1,600m apart. Of these holes, 211 returned positive results of more than 100ppm eU3O8 over 1m. This reflects an almost 63% success rate. The average grade of the 1m intersections >100ppm U3O8 is 286ppm and, importantly, in the >200ppm U3O8 this average grade increases to 429ppm which is the cut-off used in the previous resource estimates. The results of the ongoing exploration are regarded as very encouraging. 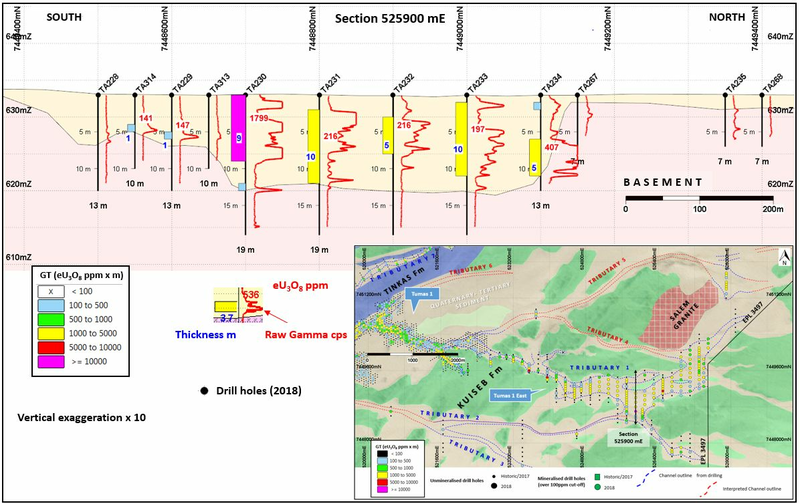 This drilling in what was a previously unknown headwater system of the Tumas palaeochannel system has identified a new continuous calcrete-type uranium mineralisation at shallow depth which will result in another resource upgrade for the Tumas palaeochannel calcrete resources. 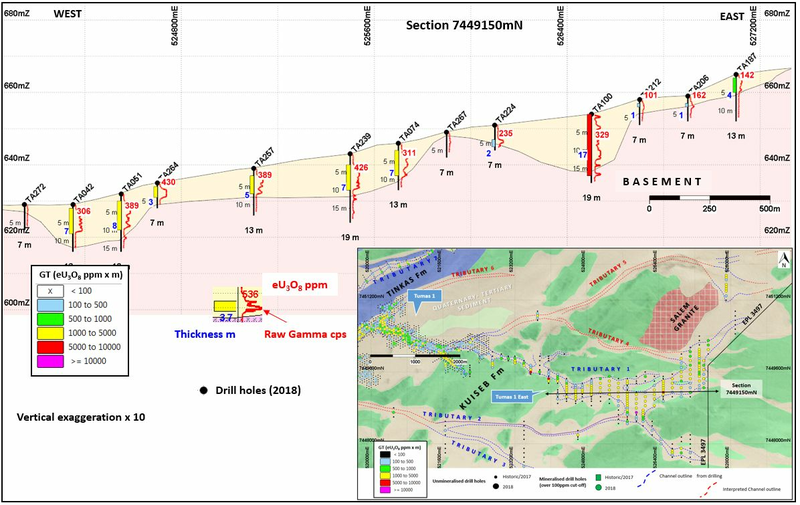 Significantly, the new uranium mineralisation identified in the tributaries of this palaeochannel system in the Tumas East area has opened up the potential for further mineralisation in Tributaries 4, 5 and possibly 6, along an extensive strike length. 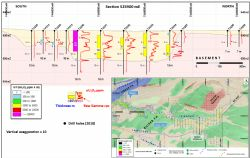 The ongoing work again confirms that the uranium mineralisation is not confined to one simple, single channel but rather is associated with a complex palaeodrainage system containing several channels and tributaries. This fourth (ongoing) drilling campaign continues to emphasise the strong exploration potential of the extensive, uranium-fertile palaeochannel system within which the new Tumas palaeochannel discoveries occur. The drill program emphasis has now shifted to resource drilling at Tumas 3 West where the two RC drill rigs are currently operating. These drilling programs will continue into December. An updated Inferred Resource estimation for the Tumas 1 East Zone, in conjunction with Tumas 1 & 2 and Tumas 3 West is expected to be delivered in early 2019. John Borshoff commented: "the Tumas palaeochannel has developed into a remarkable exploration target with drilling producing desired results on a consistent basis, rejuvenating the Reptile project significantly. The drilling campaigns that have focussed on this channel system since Feb 2017 guided by new management is uncovering huge potential. The latest positive resource drilling exemplifies the confidence we have in the potential of this target to add to our growing resource base."